Film Analytical And Appreciation Society (FAAS) comprised of Telugu Cinema Legends Akkineni, Dasari, Ramanaidu, DVS Raju in the past. FAAS Chairman Dr K.Dharma Rao has authored a book on 86 years of Telugu Cinema, 'Telugu Cinema Grantham'. This book has been dedicated to Superstar Krishna, Guinness Book Record holder, Director Vijayanirmala. The book has been launched at the residence of Superstar Krishna in the presence of many popular film personalities. Author Dr K.Dharma Rao who is an avid film lover said that His love towards cinema made him compile the information about 86 years of Telugu Cinema in the form of a book. He also shared that Darsakaratna Dasari listened to his work for 4 years and praised his effort. Special Guest Relangi Narasimha Rao said " This 484-page book along with 24 color pages with exclusive photos will serve as an encyclopedia for Telugu Cinema. I witnessed the14 years of hard work of Author Dharma Rao in bringing this book." Star couple Krishna, Vijayanirmala congratulated Author Dharma Rao for bringing such an informative book about Telugu cinema and thanked for dedicating such a good book to them in a celebratory event. Naresh VK who presided the event said that Dharma Rao did a great work by compiling 86 years history of Telugu cinema and this marks his love towards cinema. 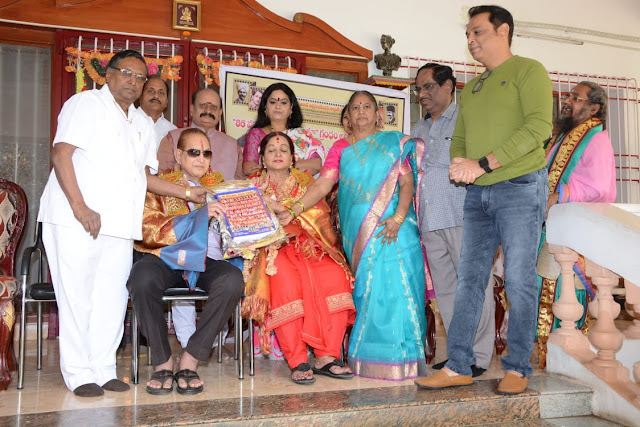 Actor Radha Prasanthi, Vamsee Ramaraju, Dr Keemala Prasada Rao, FAAS Respect Chairman Prasadarao, Kodaala Basavarao, Author's wife Smt Aadurthi Suryakumari graced the event.